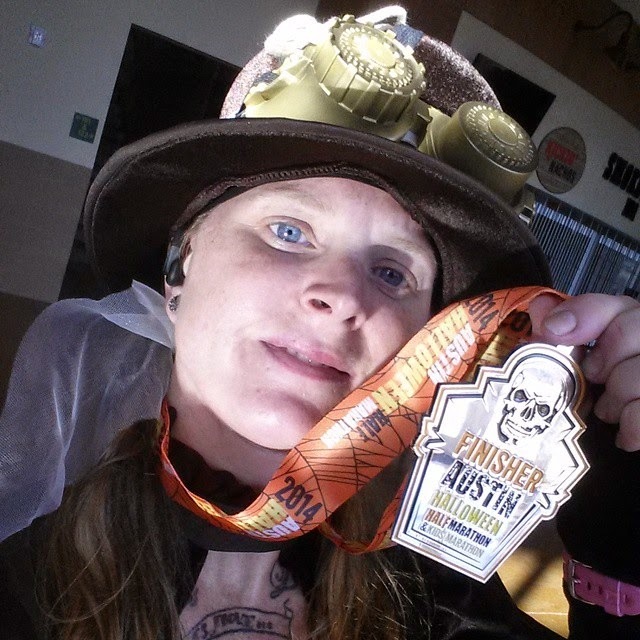 Saturday was the Austin Halloween Half marathon. Last month, after I signed up for it, I made a trip to Spirit Halloween and got myself a costume. I was thinking Dorothy or something Disney. They had a Dorothy costume I really liked but not in my size and the plus-sized one was okay but I would have had to alter it so it would look good on me…and I’m not about to pay over $50 for something that I have to alter. And the Disney costumes weren’t really to my liking. So, I started perusing the wall of somewhat generic costumes for women. I found a couple I liked and took them to the dressing room. Two of them looked horrible on me and the third one, a steampunk girl, looked fabulous, so I got that one. I got some red and black horizontally striped tights to wear with it. I used a slim piece of elastic safety pinned to the hat to make sure I didn’t lose it while running and I was off! 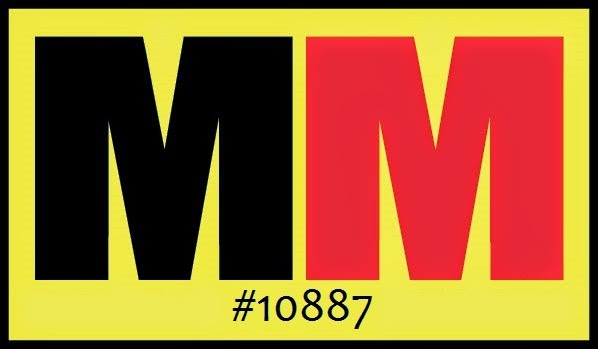 At the beginning of last month, you may recall, I ran the Frozen Hot Chocolate 10K. As I was perusing the hashtag for the event on Instagram, there was a guy that had posted some pics from the race and I also noticed he likes the Green Bay Packers (I am a fan as well), so I followed him. Since then, I’ve seen his race pics posted on his Instagram and knew from them that he lived in Texas. Well, as I’m sitting in my car Saturday morning, wasting time until it’s time to go to the start line (I don’t like doing a lot of standing around before a race if I can avoid it…don’t want to wear out my legs before I even start running!) by looking at my Instagram feed. 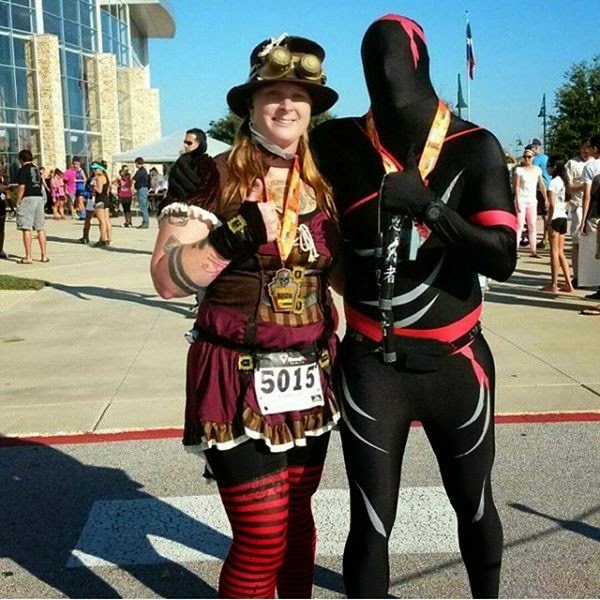 Well, I see that this guy, Rob, had posted a pic of himself in a ninja body-morph suit and he had tagged that he was at the Cedar Park Center. Wait a minute…that’s where I was! So I responded to the pic that I was at the same place and he told me where he was and I went and met up with him! It was still like 20 minutes before the race start so we just sat and chatted. We were both surprised at the turnout. There was not very many people at all. Sure, this is the first year for this event, but really, a themed race that encourages costumes? We both figured there’d be a better turnout. (when I checked the results the other day there were 572 finishers) As we made our way to the start line, he said he would start off with me and then he’d take off. He runs waaaaay faster than me. I think he said his half PR was somewhere in the 1:30-something range. Wow! My half PR is 2:28-something for an organized event and 2:24-something when I ran the 13.1 distance by myself. At that moment, I really and truly felt like I could hold the pace for the remaining 2 miles. However, about half a mile after I made my statement, I started slowing down a bit. I managed to pick it back up a little and Rob did a great job of distracting me so I could pick it up. The last mile was the worst. I was just having a super rough time trying to keep up with Rob. At one point, I thought I was going to throw up. But, we made it. I toughed it out. My finish time was 2:25:51 per the results on their website. My watch said 2:25:54. 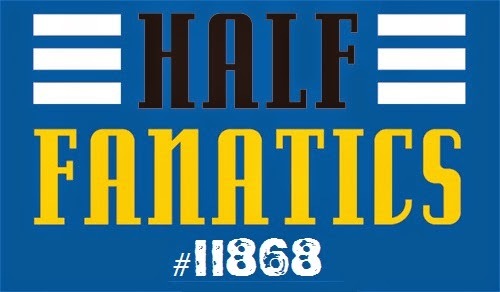 This would have been a PR had it been an actual half marathon…but it wasn’t. It was 12.85 miles…a full quarter of a mile shy. So, obviously NOT a USATF certified course. But, if I were to do the math for the remaining quarter mile as if I had ran it, then I’m pretty sure it would have still been a PR by a few seconds. So, it’s not an official PR. I’ll shoot for that next year. Not at the Austin Half…no, that one is far too hilly. It’ll have to be one of the others I plan to do. Anyway, the photographer hasn’t posted the pictures yet, but when he does, I’ll make sure to share them with you. For now, here’s the picture I took with Rob post-race plus my finisher’s selfie with my medal. My overall impressions of this race…I was disappointed when I got notification that they weren’t able to secure the Cedar Park Center for the expo (probably more likely that they weren’t able to get enough vendors to exhibit at the expo to make it worthwhile) and it was changed to packet pickup only at a local running store. The next thing I was disappointed about was that they used generic RoadID bibs. Ugh. Seriously? This is the only half marathon I’ve ran that did not have a bib that was customized for the event. I emailed my complaint to their info email and was told that there had been a problem with the logistics (not sure how that makes sense because a problem with logistics implies that there was a problem in the product being delivered) and they weren’t able to do the custom bibs this year but that they would definitely have them next year. And then, of course, I was not happy about the fact that the course was a full quarter mile shy of an actual half marathon distance). Now let’s move on to the stuff I was happy about. I LOVED the shirt. The shirt, while simple, is one of my top 2 favorite race participant shirts. My other favorite is the 2014 Austin 10/20 shirt. I loved that the course wasn’t super hilly and was part way through a country setting so it was kinda pretty. Definitely different scenery than I’m used to. The water stops were every 2 miles as promised and as far as I know they didn’t have a problem with running out of water or Gatorade. We were told there was GU at the midway point and I meant to look and grab one but totally forgot so I don’t know if they actually had them or not. The finisher’s medal is pretty nice too. Nice and shiny. While the course is short, I would definitely do this race again next year if it happens. But, like I said, the turnout was way less than I had expected, so it’s up in the air as to if it will happen again next year. I really hope it does. In fact, I already picked out what costume I want to run in. And I will be buying it next month. If this race doesn’t happen next year, that’s fine, I will find another Halloween race to participate in.